Just in time for May flowers, we are getting some of our clients’ porches in summer shape. Most of the porches we do are screened-in and provide the feeling of being outdoors while allowing the comfort of being indoors. In the month of May we will be sharing with you ideas for creating your perfect outdoor space. First, we have a porch designed for a young couple. First, we have a porch designed for a young family who live in the Green Hills area. They moved in late fall of last year and when spring approached began to start thinking of pulling their lovely porch together. With very eclectic taste, they are always interested in something different than what you may find on every porch this summer. Most of the accessories that give the space personality were purchased from our showroom and are one of a kind. The gothic window framed mirror adds a rustic touch, as does the vintage chest with a butcher block top. The mirror was placed intentionally on this wall to allow all of the beautiful greenery in the yard to be reflected into the room. Contrasting the well worn pieces are the iron elements seen in the pair of cranes, the lamp base, and the coffee table. The combination of new furniture and antique pieces make the space feel balanced and harmonious. 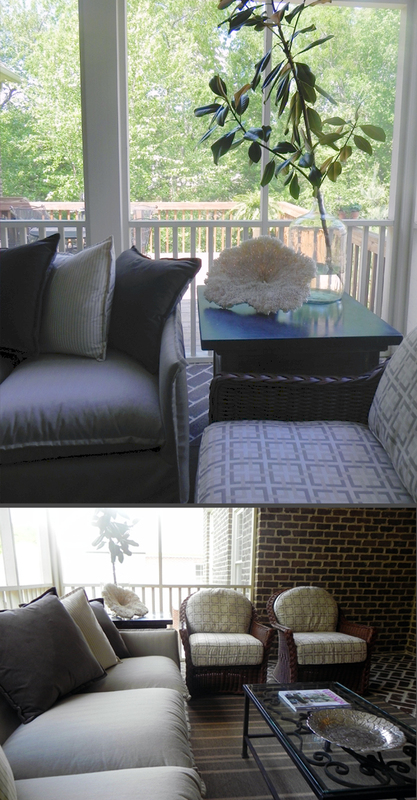 The fabrics on the sofa and the geometric print fabric on the wicker chairs are all Sunbrella. It is ideal for outdoor use and many times we also use it indoors in areas where we know easy clean up is a must. The neutral color palette is calming and just right for an outdoor space as it allows your attention to be focused on the natural colors found in the landscape. 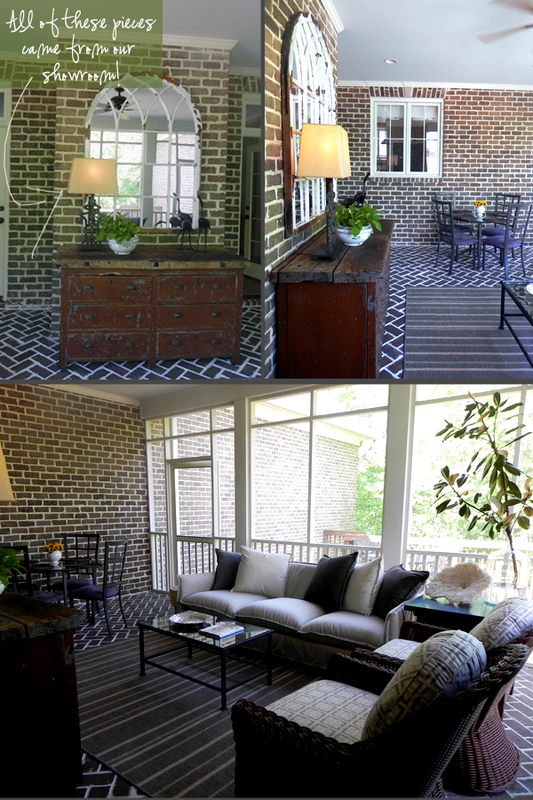 The pops of green throughout the porch provide a perfect extension of the settin and help to bring the outdoors in. Who wouldn’t love to relax out here?